ADVANCED COPIES OF THE ALBUM ARE NOW AVAILABLE FOR REVIEW AND FEATURE CONSIDERATION. (Temple, TX) – Everyone Dies In Utah have announced that they will enter the studio at the end of this month to begin recording their new full-length album. It will be the follow up to their 2012 release Polarities. The band has decided to enlist platinum producer Jim Wirt (Incubus, Something Corporate, Hidden in Plain View) to record the new music at Crushtone Studios in Cleveland, OH. There is no release date scheduled as of now. Teetering between breakneck brutality and elegant, entrancing melody, the Temple, TX quintet formed in 2008, consisting of Danny Martinez (Vocals, Keys, Synth), Trey Golden (Keys, Synth), and Nathan Chase Meadows (drums). The name of the band began as a joke, but stuck with them as time went on. It derives from the fact that the death rate in Utah was at one time higher than any other state. So far, Everyone Dies In Utah has continually connected on a deep level with its passionate fan base. Since hitting the scene, they've attracted a rabid audience over the course of their self-released EP, I Hope You Realize This Means War in 2009 and then Seeing Clearly. They've also toured tirelessly with bands such asAffiance, Sirens and Sailors, Bleach Blonde, The Overseer and more. They know that it is very important to be accessible to their fans and do not plan on getting off the road any time soon! (New York, NY) – Long Island’s own Gabriel The Marine have signed a new worldwide deal with Sun Pedal Recordings. The New York indie rock/pop band will release a four-song EP this Fall to give fans a slice of what’s to come. Gabriel The Marine will join Taking Back Sunday and Bayside for a series of Fall dates (see dates below) with plans for more touring in support of the new release. Fans can also expect the EP to be followed by a debut full length album for the first half of 2013. 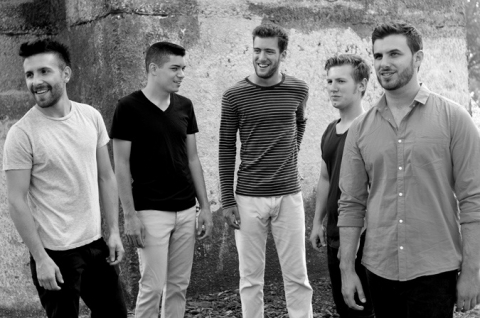 Formed in 2008, Gabriel The Marine is a violin-infused indie rock/pop quintet from Long Island, NY with a sound all their own. After two critically acclaimed self-released EPs, the band will release a new EP this Fall on Sun Pedal followed by their debut full length studio album in 2013. They are currently at work on music with accomplished producer Jim Wirt (Fiona Apple, Jack’s Mannequin, Incubus). The new studio album will be supported by extensive touring that will stretch well into 2013. Gabriel The Marine has played the Bamboozle festival twice and have toured with such artists and bands as John Nolan, Taking Back Sunday, Bayside, Jacks Mannequin, Mae, Anberlin, and the Dear Hunter. Following in the footsteps of rock luminaries such as No Doubt, fellow Californians Permanent Ability recently headed into the studio with producer Jim Wirt to work on their latest release ‘Bring It On!’. Wirt, who is best-known for producing a string of groundbreaking rock albums like Incubus’s ‘S.C.I.E.N.C.E.’ and Hoobastank’s 2001 debut, spent some time working with Permanent Ability on the funk-rock quartet’s second EP last year. However, despite only having a short history, this isn’t the first time that the LA-based group have collaborated with a well-known artist. For their 2008 debut EP ‘From the Womb to Hollywood’, Permanent Ability were joined by funk legend Lige Curry, who was formerly the bass player with George Clinton’s Parliament-Funkadelic. Stereoboard recently caught up with Permanent Ability’s frontman and founding member Brian Lanese to find out more about the band and their music. For an immediate download of Restless in your choice of 320k mp3, FLAC, or just about any other format you could possibly desire. From the production team that brought you Incubus, No Doubt, Hoobastank, Jack's Mannequin, and Something Corporate. Like a walk in the dark, you don't know where you are. And you can't see through the clouds to the stars. No one is driving and I am colliding with all that you are. Arrows broken--you can't find me any more. And I'm Restless. How bout you? Tired of feeling used. Nothing and nobody else can change the way I feel. Like and empty smile, you don't know what to guess. I am naked, and I'm lying on the ice. I am broken--outspoken for advice. Life me up. I am frail, like shadows in colour that fall upon the trail. Recorded and produced by Jim Wirt at 4th Street Recording, Santa Monica. Mixed by Jeff Hannan at MidCity Sound, Hollywood. Arrangements by Patrick Warren. Written by Jordan Thompson. of Hoobastank, Incubus, Jack’s Mannequin and other hit artists. Wirt and how do you feel the tracks turned out? now my band gets to work with the guy who made that all possible for them? we knew we could sound. What is Wirt like to record with? The guy is a machine! We did like 3 songs in 4 days or something like that? much better. It was an awesome learning experience just to see this guy work. out of tune or you just did a crappy take. said 'if a band is that good they don't need a big name producer to sound good'? Have you ever considered if it's worth your life savings to have a 'name' on a recording? with their December 14th release of Second Time Around. Listening to the Modena self titled demo you could hear heart, you could hear desire. You could hear Potential. What you couldn't hear is a radio hit. while also being powerful in their instrumentation... i.e. passionate! but always keep the underlying rock power behind their sound consistent. Songs we recommend you listen to: "Second Time Around," "Hang it High,"
There was a time when Jim Wirt was the young musician fighting for recognition, the guy rolling the dice and moving away from Springfield to take a shot at making it in rock ‘n’ roll. That was in the early ’80s, when his band Fools Face was all the rage in SGF and getting signed to a major record label and put on the radio was the big goal. Twenty-five years later all of that has changed; Fools Face split up less than a year after its move to Los Angeles, record labels are on shaky ground and Wirt, together with wife Claire, Tony Barille and Randy Chase, are out to put the power back in bands’ hands with the launch of Crushtone Music. IS a regional development Recording Company in the business of Producing, Manufacturing, Marketing and Promoting Recording Artists and/or their music products. Formed in 2009 by Tony Barille and Randy Chase along with Prodcuer Jim Wirt and his wife Claire Wirt. The Cleveland, OH based Company intends to launch recording artists on a regional basis with a "ripple outward" strategy.